George Henry Towle was born in 1881, the eldest son of Rueben and Elizabeth (née Lees) Towle. Although George Henry was born in Wollaton, Notts, the family had settled in Beeston and it is here where he was brought up2. By 1891, the family - which also included his younger brother Reuben (b.1883) - was living at New Buildings, William Street, Beeston with Reuben senior working as a labourer and his wife helping out as a lace mender, working at home3. Early in 1901, Elizabeth died and both George Henry and his father were working as bricklayers' labourers and living on Humber Grove, Beeston4. It must have been soon after this date that George Henry joined the Royal Navy. Evidently, he was stationed at Portsmouth as it was there, towards the end of 1905 that he married Mary Elizabeth Pavier5. Over the next ten years, interupted only by George Henry's tours abroad, that their six sons were born6. Sadly, their first, Reuben James H Towle, died as an infant. In 1911, at the time of the census, George Henry was serving as a Private with the Royal Marine Infantry, on board H.M.S. Pelorus, at Colombo in what was then Ceylon (now Sri Lanka)7. His wife and then family of three sons were at home in Portsea, Hampshire8. H. M. S. Viknor was used to patrol the waters between Scotland and Iceland and it is on 13 January 1915, while carrying out these duties off Tory Island, Ireland, that she was lost with all hands. There was no distress signal or contact with shore so the reasons for the loss can only be conjecture - it could have been the violent storm at the time or, perhaps more probably, the enemy mines that were known to have been recently laid, that was the cause. .Some bodies were washed ashore in North Antrim commununites - against the north wall in Bonamargie Friary Cemetery can be found find the grave of Private J. Griffin, P.O. 7084 Royal Marine Light Infantry and those of four unknown seamen from H.M.S.Viknor and, in Ballinoy Churchyard is the grave of E.R. Hewett, Royal Navy J/27300, 1st Class Boy. 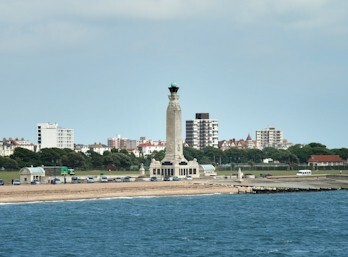 1The photograph of Portsmouth Naval Memorial is from the Commonwealth War Graves Commission website. (http://www.cwgc.org). The memorial commemorates around 10,000 sailors of the First World War and almost 15,000 of the Second World War. Essentially identical memorials are at Chatham and Plymouth. 2His baptism was at Beeston Parish Church on 5th October 1881. 31891 Census - Piece 2671 Folio 106. Both George Henry and his younger brother Reuben were then attending school. 5Mary Elizabeth Pavier appears to have been born in Q4/1885 (Portsea Island Registration District - ref 2b 478). However, this is inconsistent with her declared age (22 years) on the 1911 census. The 1881 date does, however, match that given for a "Mary E Towle" who died in Q2/1952, aged 67 (Portsmouth Registration District - ref 6b 391). 9Mainly drawn from the Royal Navy Reserves, including 25 from the Newfoundland Division of the Reserves. It is possible therefore that George Henry had been recalled as a member of the RN Reserves at the outbreak of War. 10The 5386 ton vessel was built on the Clyde in the Robert Napier yard and was 421ft long with a beam of 50ft. As "Atrato" she could carry 279 passengers.